with Elektra. On Sunday, the festivities continue with the traditional free Opera in the Park concert at Golden Gate Park that will provide samples of the five shows of the Fall season. Pack your picnic and sunscreen, pray that the heat wave keeps on until then, and enjoy your arias with a glass of chardonnay. The Spring '18 season will revive the 2011 Wagner Ring Cycle. Turandot features the well worn production with the David Hockney sets (seen before in SF in '93, '98, '02, and '11) but former Adler Fellow, tenor Brian Jagde should breathe new life into the role of Calaf. Elektra is a new production with Christine Goerke in that title role. If you think your family is f'd up, check out Elektra's, they are bonkers and Richard Strauss does a deep dive in their complicated psyches. The big event is of the Fall season is of course the world premiere of Berkeley composer John Adams's new opera, The Girls of the Golden West. Adams is the eminent living American composer, and his previous operas have reached repertory status, Dr. Atomic and Nixon in China in particular. Just like Dr. Atomic, Girls of the Golden West scores a libretto sourced by Peter Sellars from historical texts and letters. But Dr. Atomic has been knocked for its treatment of its (two) women characters: one a drunk housewife and the other a clichéd embodiment of Native-American wisdom. Golden West, on the other hand, will introduce positive and strong women. Last year's commission, Dream of the Red Chamber has been so successful it will receive a tour in mainland China that coincidentally opens this week-end as well. Traviata and Manon round up the Fall season. And it may be a bit inside baseball, but some may remember that tenor Pene Pati, after an impressive Merola program in 2013, delayed his Adler Fellowship so he could complete a tour in his native New Zealand with his highly successful Three-Tenor-ish project Sol3 Mio. He finally joined the Adlers last year, his brother and Sol3 Mio partner Amitai did this year, and SF Opera will host Sol3 Mio in December. next weekend with another rock star, mezzo-soprano Isabel Leonard. This week will end violinist (and composer) Mark Volkert's 40-year tenure with the Symphony, he's taking a well deserved retirement. Other concerts to look forward to: a semi-staged version of Boris Godunov; MTT conducting and recording Charles Ives’s Symphonies Nos. 3 and 4. MTT's affinity for Ives should make these concerts spectacular. The Royal Philharmonic Orchestra will pay a visit to Davies, and composer Charles Wuorinen will be in residence, including a world premiere commission. The least of guest conductors (Krysztof Urbański, Semyon Bychkov, Osmo Vänskä, Herbert Blomstedt, Juraj Valčuha, Pablo Heras-Casado, Stéphane Denève, David Robertson, Charles Dutoit) is unfortunately the same usual sausage party, with at least the exception of Susanna Mälkki. We expect fireworks from violinist Itzhak Perlman and pianist Martha Argerich, but Argerich has a reputation for not showing up, so we'll keep our fingers crossed. Daniel Hope (photo: Bailey Davidson) becomes "artistic adviser" for the New Century Chamber Orchestra. SF Performances: SF Performances, in a new era of its own after the retirement of founder Ruth Felt a year ago, relies on Philip Glass too! After all, the prolific composer turns 80 and shows no sign of slowing down. SF's own Kronos Quartet will lecture about Playing Glass and SF Performances will present Glass @80: Music with Changing Parts, with Glass himself. How SF can you be? Kronos will perform an SF gentrification-themed piece. It is a spoken-word chamber opera and it is NOT titled "Die Yuppie Scum." Although one should definitely write that opera, with Nestor Makhno as a character. Other performances of note: a Bernstein recital with mezzo-soprano Isabel Leonard on October 1st (she of the SF Symphony Gala, I guess she's sticking around for the Indian summer); a recital by Yuja Wang, whose fiery talent is as big as her outfits are provocative; another by Pierre-Laurent Aimard, whose wardrobe I cannot fault. And many more. Cal Performances: Gustavo Dudamel was supposed to get things going in Berkeley, but his tour with the Venezuela Youth Orchestra got cancelled when the President of that country didn't like Dudamel's political oped in the NY Times. Ouch. They still host the Riccardo Mutti and the Chicago Symphony Orchestra, Ian Bostridge, Mark Morris's Hard Nut, a super-special special event with Leonidas Kavakos, Manny Ax and Yo-Yo Ma in a chamber music dream team. San Francisco Conservatory of Music: The institution celebrates its 100th anniversary. Happy birthday, Conservatory! Next weekend is the Centennial Celebration with a concert featuring composer and faculty member Mason Bates (whose Steve Jobs opera sold out at Santa Fe last month and will be presented at SF Opera soon). There are plenty of events (listed here), including big names such as Patricia Racette, Frederica von Stade, Deborah Voigt, Jake Heggie, Steven Isserlis, Garrick Ohlsson, etc. Berkeley Symphony: Berkeley Symphony music director Joana Carneiros, who just delivered triplets (!) in February, is back at the helm, leading three of the four concerts that make the season. The first one in October features John Adams as the plat de resistance, and a world premiere of a cello concerto by William Gardiner. The one guest conductor is another woman, Gemma New, for a 100% woman-led season. Hey, SF Symphony, look here! Philharmonia Baroque: An ensemble performing on period instruments may seem stuck with the repertory of that period. I mean: it has Baroque in its name. Says who? Not Nick McGegan, who co-commissioned (with the Orchestra for the Age of Enlightenment in his native UK) a new piece for period orchestra by Sally Beamish, the Judas Passion. That's a pretty gusty move. Left Coast Ensemble: This chamber ensemble takes risk as well. Their November concert caught my eye: the west coast premiere of Kurt Rohde's Never was a knight, a singspiel told in vignettes from Cervantes’ Don Quixote for Tenor and Small Ensemble, followed by Rhode's Death With Interruptions, an opera based on the novel by José Saramago with libretto by Thomas Laqueur. Stanford Live: The Bing center hosts the St Louis Symphony, Jeremy Denk and Stefan Jackiw to play Ives, and an already sold-out recital by Renee Fleming. 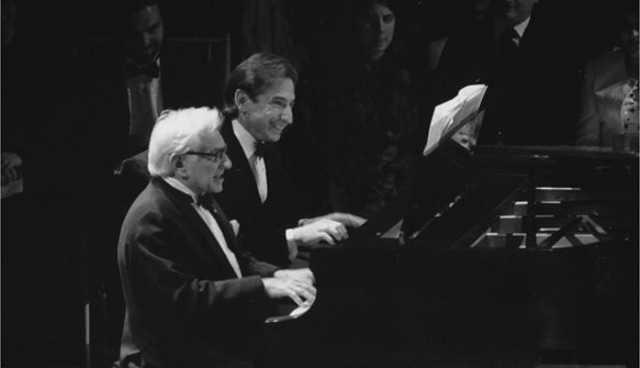 MTT and Leonard Bernstein go back a long time. Lenny will be heavily featured by the SF Symphony for his 100th anniversary season.